Vintage From Paul is delighted to offer this lovely and very retro, Water lily Dinner Plates from the Salem China Company. The creamy white body is the perfect background for the lovely rendering of the water lily done in golden yellow, bright orange accented with tonal green foliage. The water lily is outlined with pale gray and black brush strokes. The rim has a raised ribbing, creating the illusion of rectangles. 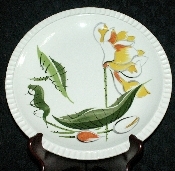 Each of the available Salem China Water Lily Dinner Plates is in excellent condition with no defects noted. The colors are vibrant, the graphics crisp. The Salem China Water Lily Dinner Plates measure 10-1/16 inches in diameter. The back are marked in gold with; "Water Lily by Salem China Co, Made In U.S.A., 50"
The Salem China Company was founded in 1898 in Ohio. Throughout the 20th century, until 1960, the company produced dinnerware as well as novelty items, souvenirs, flatware and crystal. In 1960, the company was involved in distribution only. By 1981, the Salem China Company was out of business. During its decades of production, the company made china and pottery for supermarkets, department stores and discount stores. The company's china was marketed under many different names.